Iran witnessed a nationwide strike by teachers on October 14-15. Iranian social media exploded with photos and videos of the teachers’ sit-ins at elementary and high schools across more than a dozen cities. Official Iranian media completely ignored the strike, however, while mainstream media abroad largely either downplayed the story or covered it as if the protests were only about better salaries and a consequence of US sanctions against Iran. in protest over vast embezzlement and plunder of public assets. 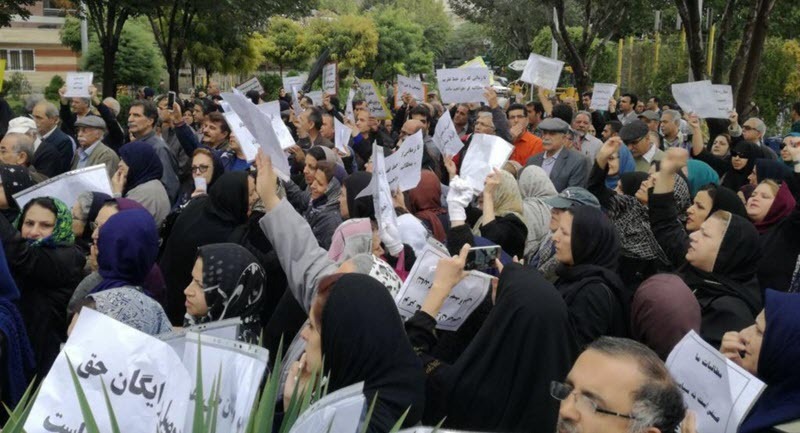 The strike was organised by the Coordinating Council of Teachers Union (CCTU) and follows the arrest of 14 teachers participating in a peaceful protest in front of the government Budget and Planning Organisation building in Tehran. Among them was unionist Mohammad Habibi who was sentenced to ten years in prison and 74 lashes. This is the first widespread strike by teachers since 2000 and was held despite serious threats by judiciary officials. 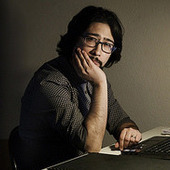 Indeed, on September 27, following a nationwide strike by Iranian truckers, Iran’s prosecutor-general, Mohammad Ja’far Montazeri, threatened the strikers with the death penalty. In September 2016, judiciary officials announced that several people had been arrested and charged over the embezzlement, but they have yet to be tried. A year later, in October 2017, an Iranian member of parliament also revealed that one of the main suspects had left the country with more than US$150m. It is still unclear why this suspect was not arrested and how he was able to leave the country a year after the investigation began. Systematic corruption, coupled with growing economic hardship, has pushed Iranian teachers to the verge of absolute poverty. In 2016, the average monthly salary of an Iranian teacher with 15 years’ experience was 2m tomans (US$473). That same year, the government announced the poverty line to be 2.7m tomans ($600) a month. In 2018, this average salary was raised to 2.5m tomans. But due to a drastic fall in the value of Iran’s currency, that is now worth around just US$227. The alarming message behind the multiplying strikes by civil servants has been totally ignored by the government. On the same day as the teacher’s strike, along with several other protests by civil servants struggling to make a living, a number of governmental organisations allocated a multi-million dollar budget to fund the religious ceremony of Arbaeen in Karbala, central Iraq. Millions of Shia pilgrims gather for this annual event – and it is used by Iran as a massive demonstration of its power in Iraq. Unsurprisingly, the government reacted by arresting more members of the CCTU teachers’ union. But it seems that the CCTU was using this two-day strike to evaluate its ability to mobilise and prepare for a joint general strike with other civil servants. As the CCTU warned in its statement, a bigger strike is likely in the near future. Over the past year in Iran we have witnessed two different types of politics, both of which are responses to the country’s political, social, and economic crises. The first type is an externally originated, or “exogenous”, politics. This type defines itself in confrontation or agreement with an outside force larger than itself. Iran’s Reformists are a typical example of this – they define themselves as being against fundamentalism and conservatism, but also as being part of the larger body that is the Islamic Republic (which, ironically, is both fundamentalist and conservative in nature). The second, more interesting, type is a kind of “endogenous” politics. While this type reacts to and opposes external sociopolitical and economic problems, it is held together by the internal, collective identity of those behind it. The recent strikes and protests by teachers, workers, women and students are examples of this because the individuals involved are motivated and held together by nothing more than their collective internal identity as teachers, workers, women or students. In the past, protests by the latter were easily dismissed by, or rather dissolved into, the abstract demands of a unified revolutionary mass as happened in the 1979 revolution. Increasingly, however, the protests – by teachers, by truckers, by women – are echoing one another, amplifying the overall message of discontent in pluralised form. The recent strikes and protests, then, are evidence of a new kind of mobilisation in Iran, a kind of “people power” that is decentralised and shaped by each individual’s sense of identity. It is a form of opposition more like a rootstock or rhizome – able to spread quickly and pop up anywhere. This may well herald a new era of dissent.